When our world becomes a mere pawn in an epic battle between Heaven and Hell, Jason Dark faces a challenge that threatens to shatter the very fabric of reality. As immortal angels die and harbingers of death and destruction escape the fiery pits of hell itself, the Geisterjäger and his companions receive a desperate call for help! Will they be able to save mankind in the face of an onslaught of demons or will our fate burn as brightly as the streets of London? I’ve read the sample for this book and the writing is very evocative of setting and mood, gothic in an old-school sense, which makes it distinctive for the horror genre. Hiya, Guido. I love those wings on your cover, *whispers* even if the blood is a teeny bit troubling. So your your Muse must be doing a great job inspiring you. What’s the next project they’re helping you out on? After finishing “Fu Man Chu’s Vampire,” I have actually decided to write another game, as opposed to writing another book. I am originally coming from a computer games background and I just felt the desire again to create a new casual game for mobile devices. Usually flip-flopping between disciplines helps me to keep me creative juices flowing. Cool! I’m a big fan of Bubble Town, but that’s probably not what you’re talking about. *sighs* it’s not very adventure-y. Say, which of your characters are you most like? One of the game ones? I am not sure I am anything like any of them. Not even a teeny bit? That makes sense. A lot of authors—mine included—say that there’s a piece of them in a most of their characters, and yours have very interesting names. So, what’s your favorite book? Is it scary too? Mark Frost’s “The List of Seven” is my all-time favorite. It is a book I re-read every other year, and it is the book that has influenced me tremendously in the creation of my own Jason Dark series of supernatural mysteries. It is the book I wish I had written. Ah! All writers have one of those! Now, I’m gonna ask you something and it might seem strange, but in your opinion what makes a guy character swoony-worthy? I’d love to see Jimi Hendrix. I was too young to have had the chance to ever see him perform, but his influence on rock music can still be felt in almost every rock guitar player. I would have loved to see the emotional magic he did with his guitar every time he entered the stage. Awesome! I know all kinds of random stuff about him…like he couldn’t read music and was left-handed so he had to play his guitar upside down. Over in Paradise he’s setting his guitar on fire every night, but it’s not anything like your book. Anyway, It’s pretty cool. If you want to see him…way down the road, that is, you need to do the confession thing. So, what’s your biggest writing sin? That I do not take my writing seriously enough. I know fellow authors who sweat over every word. Some of them would rather give a limb than change a word they wrote. I am usually not in love with my writing. If an editor suggests a change, and I agree with the reason, it is easy for me to simply make the change. I’ve never seen myself as the ultimate authority – not even when it comes to my own work. That doesn’t sound very bad, Guido! Now, are you more of a rule follower or a rebel? Why? Until recently I didn’t even care about the three-act structure in writing. It was something I left to others. I have embraced it a bit more these days, but still, I prefer to write the way I feel the story should unfold and flow and not the way the academic rules try to impose on me. So, call me a rebel. Hurray for rebels! They’re the humans who change the world and it wouldn’t be good if the world had never changed and evolved at all. What — other than your Muse, of course — inspires you? My creativity lives off cross-pollination. I can get inspired by anything, an image, a mood, music, a line of lyrics, a word someone says, the list is endless. I find other people’s enthusiasm endlessly inspiring, too, though. Every time I come back from a writer conference, I usually just want to sit down and write, write, write. I love that so many different things inspire you! What themes do you write about or what do you want readers to take from your books. I simply love to toy with these thoughts and ideas, spin a story around them and in the end I hope reader will simply have a fun read. A diversion. Those are awesome “what ifs…”, but I must confess the one about the demons in heaven scares me…hmm…but, that’s the point, I suppose. Finally, is there anything you’d like me to mention to your Guardian Angel? Oh, Guido! There are a lot of humans in Paradise who would tell you otherwise. It does work, I promise. Unfortunately, sometimes it seems like it takes too long. Keeping being good. J I’ll say “hi” to your Guardian for you. Thanks, Grace and Guido. If you’re a fan of scary stories check out Guido’s books on Amazon here. September 11, 2012. 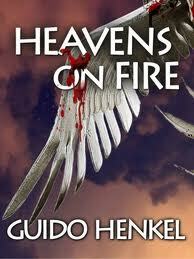 Tags: author interview, Guido Henkel, Heavens on Fire, Shel Delisle, Winging It!. author interviews. September 11, 2012 at 12:27 pm. Permalink.